These longboards usually feature a symmetrical shape that keeps the rider positioned in the middle of the board. The term 'drop-deck' comes from the lower-set position of the board to the ground and this results in more stability at higher speeds and minimizes what we refer to as 'speed wobbles'. In some cases the 'deck' (wood) dips down between the wheels and rises at both ends where it is attached to the trucks (Drop-down). The other common shape of drop-deck is a 'drop-through' deck that is flat across, but the trucks are screwed in from the top, thus allowing the deck to sit lower than a pintail or traditional skateboard. Drop-decks are intended for people who want to go fast and ride down hills, but are still very fun to use if you're just going for a leisurely cruise! 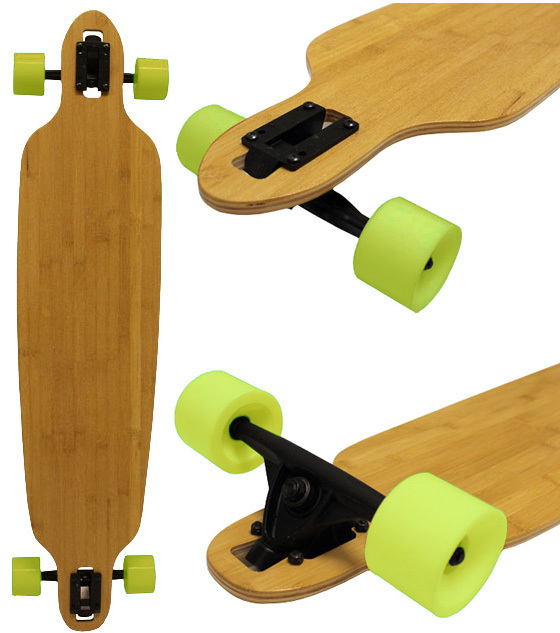 These boards are suitable for anyone interested in any form of longboarding! These longboards are very common and have more of a surfboard shape to them. They are directional (distinct front and back) and are perfect for going for a recreational push! The shape and length of these boards allow you to go further with less effort and energy than a shorter board and are great for carving back and forth along the bike path! Cruisers are shorter boards that look more like a skateboard from the 80s. They have a directional shape to them, they are usually wider than a skateboard, and they have the bigger softer wheels for a smoother commute! Cruisers are great for riding in higher foot traffic since they are smaller and quicker to maneuver and offer more of a 'skateboard' feel than drop-decks and pintails. This option is awesome for 'cruising' downtown, to work, or to school. Also the smaller shape can fit in a locker better than the longer options!